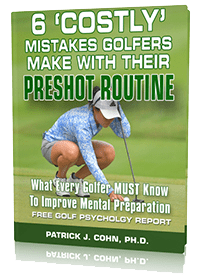 In “Golf Psychology Sessions with Doc,” Dr. Patrick Cohn answers a question from Karl about taking your practice swing to the course. Visit Sports Psychology for Athletes at Peaksports.com and click on contact us to submit your mental game questions for Dr. Cohn to answer in his mental game videocast or podcast. Have you made any swing changes recently that have improve your swing in practice, but can’t take it to the course? The hardest part about make swing changes is the fact that you have to unlearn the old swing and replace it with a new swing. How can you take your new practice swing to the course? Learn Proven Strategies to Perform with Confidence! Do you suffer from fragile self-confidence after missed hits, playing with strict or high expectations that undermine confidence or the inability to play freely and relaxed on the course? Successful golfers have learned how to perform with ultimate confidence in competition, so we’ve developed The Golfer’s Mental Edge Workbook and CD program to help you do this! The Golfer’s Mental Edge program includes the top 8 mental training sessions I do with my personal students to help them boost their mental game and improve consistency on the course. The Golfer’s Mental Edge program includes 8 confidence-boosting CDs, MP3 audio recordings and an 8-session golfer’s mental edge workbook. Improve Your Mental Game Today! Call us about golf psychology coaching today at 888-742-7225. Read more about our mental coaching programs for golfers. 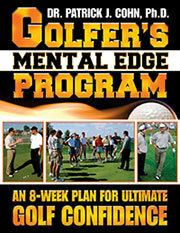 Browse our golf psychology CD and workbook programs.